This is a large painting of the Veitch farm on Windermere Road. Interestingly enough, across town on the same day as my opening, was the opening for Sara Jane Doberstein and Annie Veitch at the Gateway Gallery owned by Anita Stephenson. I managed to get to the opening before the artists left and asked Annie if she was related to the Veitch’s of that farm. It turns out that her grandfather was born there! That show is still running and very worth seeing. 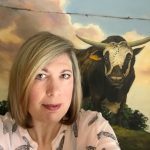 Annie and Sara Jane are incredibly talented – Sara Jane has been honoured by the Oil Painters of America three times… and Annie’s metal sculpture is reminiscent of Hilary Clark Cole, but even finer in her detail. These women are artists to watch…. Last week was an adventure as I mentioned in my previous post. I had the privilege of spending some time with photographer Bev McMullen and peering further into the history of the town in which the house from “Twilight” occupies. 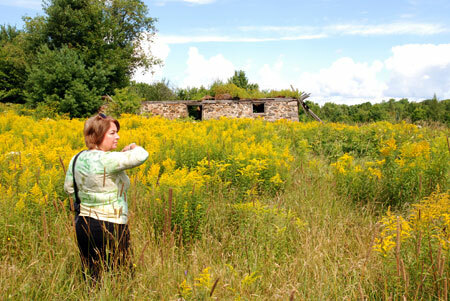 We explored the property after some photos were taken of the painting in front of the actual the old house. (I hope to share these with you in September) There was a collapsed barn in the back of the property with a beautiful granite foundation. At the house, we were able to see how the porch had lifted (or the house sank) as the bottom of the doors was below the deck! 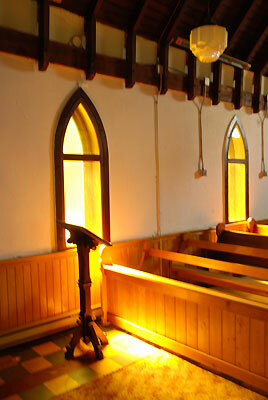 We also visited the St. Paul’s Anglican church, which I wrote about in May. This time we were able to go inside. The photo here is a little out of focus because I did not have my tripod with me, but I will return to shoot it again. The light was magical coming through the stained glass windows. I plan to paint this one later this year and perhaps offer it as a means to raise money to restore the beautiful old building. We’ll have to see if that can come about. Thank you to Bev for the wonderful suggestion – I can’t wait to give it a try! Later that afternoon, I had the opportunity to return on my own to Cooper’s Falls. 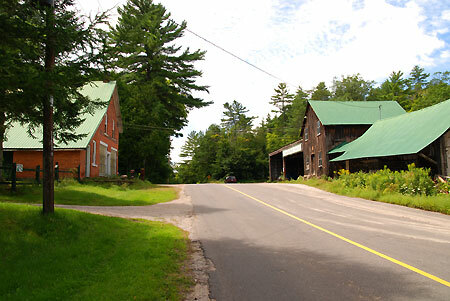 Now this town still has a handful of residents so it is not quite a ghost town, but the general store closed in 1960 and only one church remains open for summer services. Frank, the 86 year old grandson of the founder, Thomas and his wife Emma Cooper, happened to be on his porch that afternoon and offered some stories. I did not have the presence of mind to get his photograph – but he invited me back so you can be sure I’ll get it the next time! 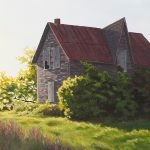 I also have a new painting in the works of the old community hall where Thomas held court as the justice of the peace. With some of Frank’s memories to share and hopefully a painting and some new photographs, I’ll likely save that post for the end of the month….. including how a tragic accident closed the mill in 1924. But I will share one interesting story Frank shared with me. There are two gas pumps at the Cooper’s Falls store. One was for gasoline and the other for kerosene. 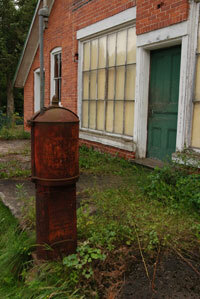 One day, the delivery man mixed up the pumps and put gasoline into the kerosene tank! Needless to say there was a great deal made over this as gasoline was much more volatile than kerosene. Many folk would use kerosene to get their stoves going in the morning and to put gasoline in instead could cause a rather explosively unpleasant surprise, and if one was very unlucky – a fire. Frank mentioned that a woman accidentally did this very thing by mixing up her cans of kerosene and gasoline in the kitchen. She set her curtains on fire. Luckily this was all that burned…. Another painting and a trip to Victoria Falls coming up this week! Beautiful, Michelle! I know all of these places well and just drove by the Veitch Farm last week. You’ve captured it wonderfully. Hoping to make a trip down to the Gallery to see them all! You have a wonderful life, filled with adventure. Beautiful painting. 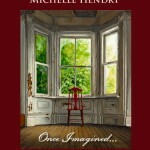 Michelle, I love your narratives, photos, and paintings! How wonderful to preserve all of this. 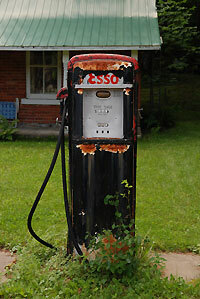 My dad worked for “Esso”, and when he started there, I think it was “Humble”. Thank you Jennifer… Nice to see you! Jean – Now that is an interesting bit as “Humble” is anything but an oil company! I am glad you enjoy the stories. Awesome painting & how cool on the connected story! The gas/kerosene one is terrifying to even contemplate! Thanks Lana – I am beginning to see how connected this area is… As for the kerosene – no kidding!! I enjoy all the stories from the area…what came before has always interested me!!! 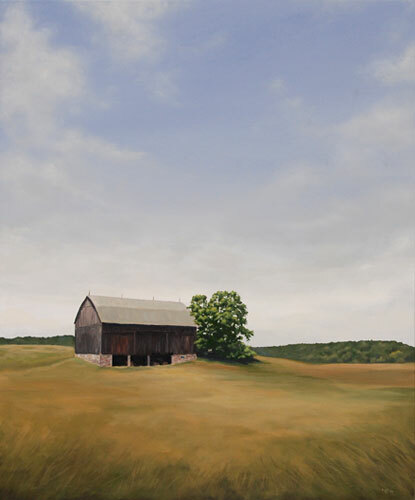 This is a wonderful painting…I particulaily like how you did the beautiful sky large…sets off the barn perfectly!